The Buriganga has become the primary dumping ground for nearly 1,000,000 city residents living on or near the riverbank. 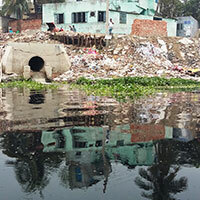 Insufficient municipal waste management facilities exacerbate this maltreatment of the Buriganga, as people throw refuse into the river indiscriminately in the absence of suitable alternatives for trash disposal. Debris from poorly‐maintained and demolished buildings along the riverbank also crumble into the Buriganga, increasing the burden of hazardous waste now choking the river. In addition, the Buriganga struggles due to the direct discharge of raw sewage into the river by the Water Supply and Sanitation Authority of Dhaka (Dhaka WASA). This contributes tremendously to the river’s degradation. Every day the sewage of central Dhaka’s 10 million plus inhabitants, amounting to 10,000 cubic liters, flows into the Buriganga and other rivers of the city. Of this, only 20% is treated, 40% is partially treated, and the remaining 40% receives absolutely no treatment.